A superb sounding analogue pedal that exudes quality from every lovingly-produced element. Vintage vibe. Easy operation. 'That' chorus sound. Difficult to try before you order due to scarce availability outside the US. Since 1985, Analog Man's very own Analog Mike has been on a personal crusade for the perfect guitar tone. Vintage gear does come at a price though, and cool vintage pedals are becoming a rarity. One particular pedal that's hard to find an original example of is the Electro-Harmonix Small Clone, which was one of the best chorus pedals ever made. Produced back in the late 70s, it remained hugely popular until production ceased in 1983. Its smooth, shimmering chorus is a staple of so many classic tracks, and it achieved notoriety when Kurt Cobain used it heavily on Nirvana's breakthrough Nevermind album. 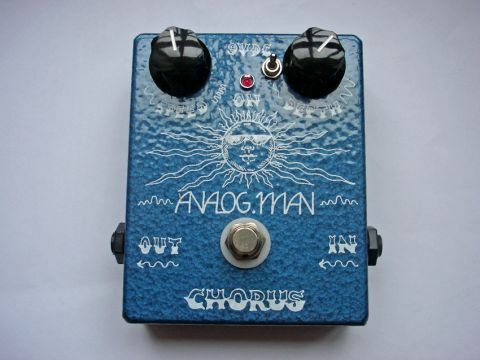 Although these days Electro-Harmonix manufactures its own Small Clone reissue, Analog Man has reproduced its own version. However, it's much more than a simple 'clone' of the original. The very best NOS (new old stock) components sit alongside some new upgrades, as well as some more modern day improvements like a true-bypass 3PDT footswitch and the option of AC power. "There's little else on the market that even comes close." As well as being sonically improved, the neat circuitry is housed in a rugged MXR-style, powder blue enclosure. Unlike the sometimes unpredictable original models, it'll hold up electrically and physically during the most demanding of gigs, and is perfectly sized for pedalboards with limited space. We get two simple controls: speed and depth. Slower speeds are useful for doubling effects, whilst higher settings create some fantastic leslie sounds as well as some more extreme ring modulation effects. The depth control allows you to create anything from a mellow 'just there' to a magic watery sound. Such a pleasing range of sounds allows you to dial in anything from classic swooshy Nirvana to vibe-heavy Hendrix quickly and easily. We also had the optional 'deep' three-position toggle fitted. For an extra $25, this allows you to go from normal, to thin TC Electronic-style chorus, to a thick bottom-heavy sound that sounds great on guitars and even on bass. If it's versatility you're after, Analog Man also does a Bi-Chorus version (four controls for two sound presets) and a stereo option. If it's supreme quality and lashings of rich chorus without the vintage price tag, there's little else on the market that even comes close. Although it's hard to try before you buy outside the US, it's easy enough to order any of Analog Man's pedals online, and the sheer quality alone justifies the extra effort.